The number of military veterans in the country’s jails and prisons continues to drop, a new report from the Bureau of Justice Statistics shows. It’s the first government report that includes significant numbers of veterans of the wars in Iraq and Afghanistan — and the findings defy stereotypes that returning war veterans are prone to crime. 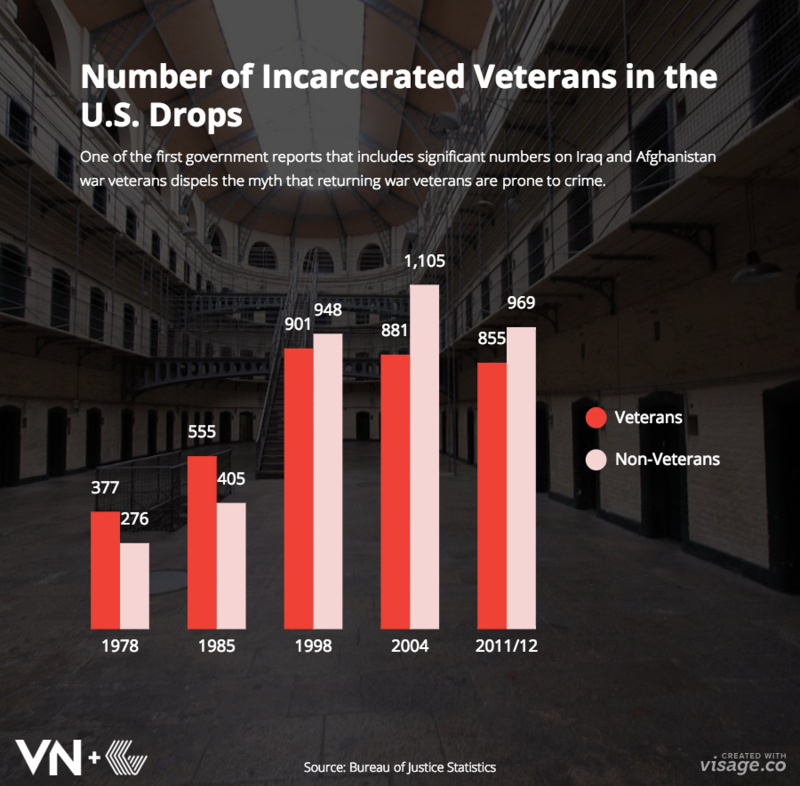 The data shows that veterans are less likely to be behind bars than nonveterans. The study tracked an estimated 181,500 incarcerated veterans in 2011-2012, 99 percent of whom were male. During that period, veterans made up 8 percent of inmates in local jails and in state and federal prisons, excluding military facilities. On average, veterans doing time are almost 12 years older than nonveterans and are less likely to have multiple previous offenses. Advocates for veterans also credit the lower incarceration rate partly to increased services for returning veterans. For example, most states now have “veterans courts,” where veterans can get treatment for PTSD and drug abuse in lieu of jail time for certain crimes.